Barcode Datalink recently implemented a warehouse solution for one of our clients who is a large multi-national company distributing floor coverings from Sydney, Australia. We installed two new AP-5131 access points and four MC-9090 mobile computers. 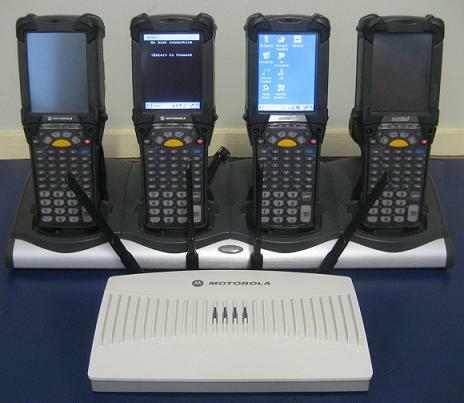 They noticed operational efficiencies within one week of installing the Motorola system. We’ve detailed their situation below to provide an example of how we can help your business in the same way by using Motorola mobile computers with SAP. He then uses a form designed for tracking stock movements. He will hand write on the form the current bin location (A-1-1), the 12 digit roll number (152345983204) and the new bin location (C-5-2). This form will be completed at some stage throughout the day, and in this particular company there are a few storemen who may each complete a number of forms daily. The supervisor will collect all the stock movement forms at the end of the day from each of the storemen. He will then enter the details of all the stock movements into SAP either that evening or the following morning. The data is updated immediately to SAP via the wireless LAN in real time. Overall this task has taken no more than one minute and the risks listed above are no longer an issue. There is no longer any hand writing, no chance of lost paperwork, and instantaneous update of information to SAP rather than being updated the following day. Customer calls asking for 4 metres of floor covering. Storeman receives the order and looks for the roll and finds it is not in location A-1-1. Someone else in the warehouse advises the roll has been moved to C-5-2 but SAP is not yet updated. Storeman locates the roll in C-5-2 and proceeds to cut 4 metres for customer. In the cutting process they accidentally ruin 2 metres. So the customer receives their 4 metres and there is now only 4 metres remaining on that roll. Storeman updates the stock tracking form advising 2 metres had to be written off. In the meantime another customer calls and asks for 6 metres. The sales team check SAP and see there are 10 metres in the warehouse in location A-1-1. Storeman receives order but it is too late to advise the customer that they only have 4 metres in stock as the customer is already on their way to pick up their order. Another customer calls and the sales team can instantly see in SAP that there are 4 metres in location C-5-2. They can advise the customer on the spot that they do not have enough in stock but will call them when more stock arrives. Scanning in real time means this company can provide its staff and customers with real time accurate information. Moving stock couldn’t be easier - just 2 scans!